Girasole apartment is located in the centre of Italy, in Tuscany, in the Commune of Montepulciano, in the province of Siena just halfway between Florence and Rome. It is in restored farmhouse, built in 1878. The long, cypress-lined drive leading to the farm sets the tone of country elegance. The farm is also provided with an outdoor sitting area in the large garden, barbecue, swimming pool (13x6 mt. ), a parking area for the guests use. Then there is also a vegetable garden available in the summer time for the guests. a dining area with fully equipped kitchen, with a gas stove top that has different sized elements, so you could pick one to suit the pot and not flames leaping up the sides; fridge, microwave oven, American Style Coffee machine, toaster and the table could be extended. There is a sitting area where there is a comfortable sofa for catching up on a good book and relax talking or watching television. a bedroom with matrimonial bed (or possibility to have two twin beds) and ceiling fans; decorated with Trompe l’oeil picture of yellow sunflowers typical of the area which gives the rooms a cheerful aspect. Its own bathroom with Jacuzzi hydro massage tub, separate shower and hair dryer. an other bedroom with matrimonial bed, ceiling fans with its own bathroom with shower and hair dryer. satellite TV: CNN, EURO SPORT etc, personal safe, Internet connection, telephone for making internal or external calls and independent heating. All windows have mosquito screens. Empoli-Siena-Chiusi line: Montepulciano Station, 2 kilometres far from our estate. Milan-Rome line: Chiusi-Chianciano T. Station, 19kilometers far from our estate. Take the A1 (Autostrada del Sole) and exit at VALDICHIANA – BETTOLLE, make your way to Torrita di Siena, at the first traffic lights turn left, follow the indication “VIA NOTTOLA” and go straight until you reach the town of Gracciano. At the crossroads turn left to Montepulciano Stazione (station) then go straight to Valiano.Once you cross the motorway bridge keep going straight for 1,5Km, the estate “Le Manzinaie” is standing on your left. Take the A1 (Autostrada del Sole) and exit at VALDICHIANA – BETTOLLE, turn right, take the superway to Perugia; exit toFoiano della Chiana and follow the indications for “Chianacce”. Go straight (for some km) until you reach the crossroad; here turn right for Montepulciano Stazione, go straight on for about 1,1 km. Podere Le Manzinaie is on your right. 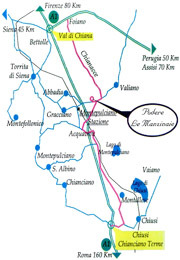 (Le Manzinaie is approximately 18 Km from the Chiusi exit). until the exit “CHIUSI-CHIANCIANO T.”.After the toll plaza, turn right and follow the signs to Montepulciano and Siena. After travelling approximately 5 Km. Turn left towards Montallese. Here follow the indications for “Sinalunga -Siena” and go straight on.You will go through 2 small villages: Tre Berte after 4 Km and Salcheto after 2 more Km. At Acquaviva (2 Km later) drive through and follow the sign to Valiano which is approximately 2 Km after Acquaviva. At the first Stop, go straight on and pass the crossing train. Continue straight until you reach the crossroads (on your right you can see a warehouse for building materials). Follow the directions for Montepulciano Stazione, turn left and go straight for 1Km. The estate “Le Manzinaie” is on your right. 1 box of tomatoes “pelati” 250 gr.